seems cu the recha of ladronicia of car at aruba is follow y not have as of frena this niether. chofernan on the caminda of kibaima tanki flip just pabao of the tanki of water cu have at balashi owing to beat alarma close police mirando cu two car owing to stay throw full pluma. all two is toyota y one of they assure is of one compania of huur car mirando cu still the have his sticker on dje stick. practicamente is skeleto owing to stay of the two autonan here. 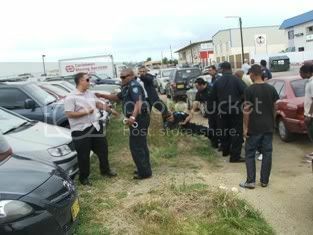 the fotonan here is ilustra all cos. police owing to come see the situation y all thing can owing to haci is coy number of chasis for see if can succeed trace the owner of the car via keurings lokaal. ORANGE CITY - The investigation into the incident in Rancho Street on February 22, with a 56-year-old man was killed, this week half suspect arrested. Thus, the Public Prosecutor (OM). Previously J.v.d.B. arrested on suspicion of manslaughter. He is still solid. The exact circumstances of the incident is still not clear. According to witnesses the victim was arguing with one of the defendants and was at one time with a knife stabbed. Subsequently, the victim with a brick on his head beaten. He died several days later in hospital. B. Suspect was convicted in 2004 for murder and then acquitted on appeal. yesterday morning one mother owing to arrive cu his child of 2 year at sitting-room of emergencia of dr. horacio the. 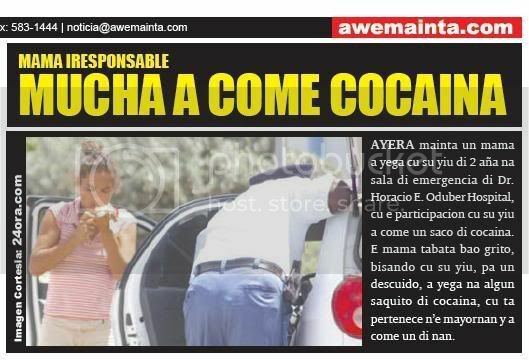 oduber hospital, cu the participacion cu his child owing to come one saco of cocaina. the mother was bao cry, saying cu his child, for one descuido, owing to arrive at some saquito of cocaina, cu is pertenece n’e parents y owing to come one of they. 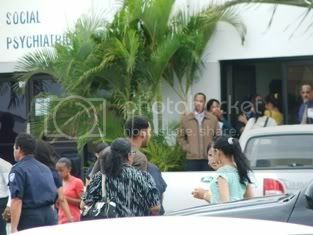 yesterday morning one mother owing to arrive cu his child of 2 year at sitting-room of emergencia of dr. horacio the. 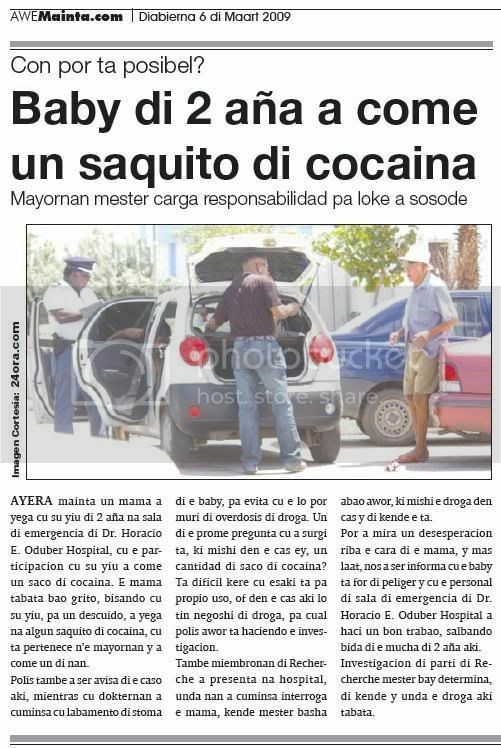 oduber hospital, cu the participacion cu his child owing to come one saco of cocaina. the mother was bao cry, saying cu his child, for one descuido, owing to arrive at some saquito of cocaina, cu is pertenece n’e parents y owing to come one of they. police also owing to being avisa of the caso here, while cu dokternan owing to cuminsa cu labamento of stomach of the baby, for evita cu the will can die of overdosis of drugs. one of the first question cu owing to surgi is, what touch in the cas ey, one cantidad of saco of cocaina? is dificil believe cu this is for own usage, or in the cas here will have business of drugs, for cual police now is haciendo the investigacion. also miembronan of recherche owing to present at hospital, where they owing to cuminsa interroga the mother, that have to pour abao now, what touch the drugs in cas y of that the is. can owing to see one desesperacion on the cara of the mother, y more late, we owing to being informa cu the baby is for of danger y cu the personal of sitting-room of emergencia of dr. horacio the. oduber hospital owing to haci one good trabao, salbando life of the child of 2 year here. 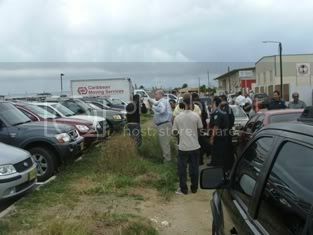 investigacion of part of recherche have to bay determina, of that y where the drugs here was. 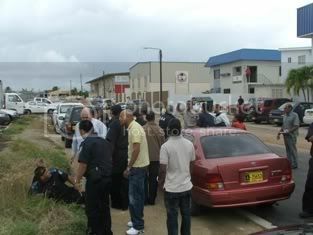 police owing to bay fiyostraat for one car cu supuestamente is procedente of abstraction but owing to achieve various situation eynan diahuebs nightfall owing to enter informe cu in fiyostraat will have one are of joven coriendo rond cu one car toyota tercel blanco y one rato after owing to enter another informe cu they're bezig is desarma the car behind in the cura of cas. at once one patrol owing to dirigi his self at the adres y enberdad they owing to achieve one car cu is cuadra cu the descripcion in the cura of the cas, eynan they owing to talk cu one person cu owing to declara cu the car is of his primo y they're bezig is place tint. owing to controla the number of the car but this not was cuadra so self owing to succeed achieve know the name of the primo y of the person poniendo the tint. one rato after hour cu the patrol owing to end of bandona the sitio, is enter informe cu the primo ey is being busca y have orden of detencion pe for ladronicia of car. the patrol at once owing to go back at the adres where cu at they arrival they owing to ripara cu one another tercel blanco also cu was stop fast owing to bay for of the sitio. for place more presion for achieve the suspicion one such jean carlo cruz owing to dicidi of bay cu his supuesto toyota tercel at keep of police. at instant cu the takelwagen was sacando the tercel for of the cura the mother owing to wing atencion of the child y this at his file owing to lose all sort of respet for his mother y owing to insulte very ugly fast of polisnan cu of trip owing to bay dune one lesson of as con for her dirigi his self at his mother. one overall of 8 sospechoso will present today in corte for deal the caso penal cu ministerio publico owing to cuminsa contra they. the are here of one or another as is envolvi in one serie of caso of tiramento. the first caso is contra the colombiano l.e.p.b. the is wordo acusa cu among 1 of december 2007 till 26 july 2008 owing to participa in one organizacion cu had because; aim for comete crimen. therefore.b. 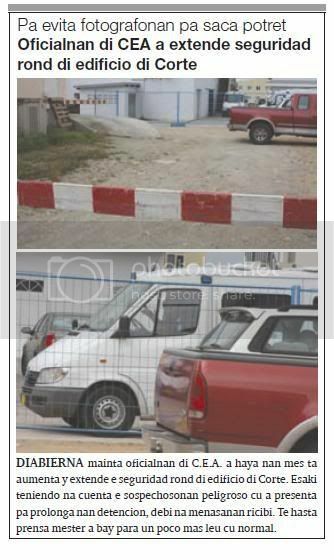 is wordo acusa apart from posesion of one pistol on 20 of july 2008, without had permission p’esaki, y of posesion of one pistol y/of one revolver on 26 of july 2008, without permission. the caso here is wordo deal in form militar or as will bay have one oficial high militar present sit near of huez for evalua the caso y finalmente will dicidi what castigo will have to impone. after is follow the caso contra one another ex militar, esta k.j.s.g., that also is wordo acusa of owing to throw cu arm on person. s.g. is wordo acusa of among 1 december 2007 till 26 of july 2008 owing to participa in one organizacion cu had because; aim for comete crimennan come across. alabez the is wordo acusa of posecion of one pistol on the self date ey, without had permission. the caso here will wordo deal same cos cu esun upstairs menciona. after is follow one caso cu 6 sospechoso kendenan ta: d.g.d., h.j.j.c., owing to.c.d.w., n.w.w. y owing to.k.a.t. contra the are here also have one serie of acusacion cu have of haci of tiramento at various lugar y formacion of gang. d., c., owing to.w., n.w. y t. is wordo acusa cu in the period of 1 of december 2007 till 26 of july 2008 they owing to participa in one organizacion cu had because; aim for comete crimennan. ORANGE CITY - A 2-year-old child yesterday accidentally received cocaine and was urgently transported to the hospital. When the mother realized that her child apparently winding around cocaine had eaten, it is directly to the Emergency Help section of the hospital gesneld. As they stated that her child 'poison' had eaten. The child was then immediately treated. A urine test showed traces of cocaine when the police turned on. Coincidentally present agents are directly related to the mother to talk. They confisqueerden a number of suspected cocaine bags from her car. The child makes good yesterday but was still in the hospital for observation. 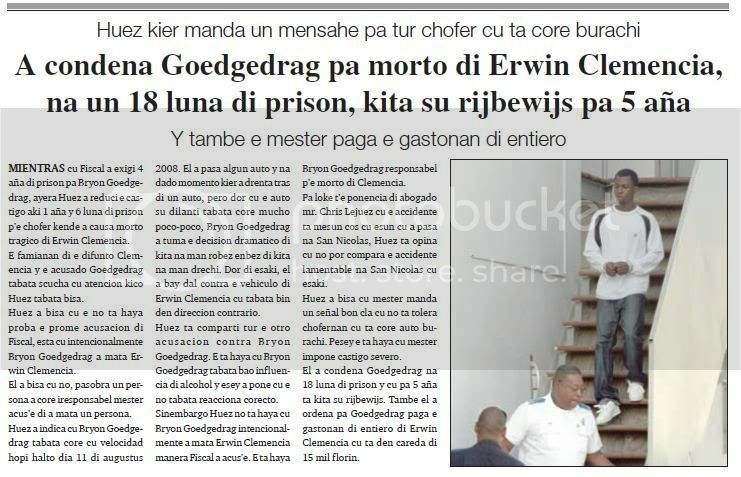 oranjestad – today is the day cu corte in first instancia is deal the caso penal cu for of ana happen owing to cuminsa contra the are here but upstairs peticion of fiscal this owing to stay posponi for today. in the caso here have two ex militar envolvi y all the are is wordo sospecha of owing to participa at one or more tiramento. the first caso is contra the colombiano l.e.p.b. that have one serie of acusacion contra dje among another posecion of arm of candela y even of owing to throw. among 1 december 2007 till 26 july 2008 owing to participa in one organizacion cu had because; aim for comete crimenan. also the is wordo acusa of owing to, conhuntamente cu one another or others, throw cu one arm of candela in direccion of one y/of two person on 20 of july 2008. cu the intencion of less they life. p.b. is wordo acusa apart from posesion of one pistool on 20 of july 2008, without had permission for this, y of posesion of one pistool y/uf one revolver on 26 of july 2008, without permission. alavez the is wordo acusa of posesion of patronchinan in the period of 25 till 26 of july 2008, without permission. the caso here is wordo deal in form militar or sca will bay have one oficial high militar persente sit near of judge for evalua the caso y finalmente will dicidi what castigo will have to impone. after is follow the caso contra one another ex militar esta k.j.s.g., that also is wordo acusa of owing to throw cu arm on person. s.g. is wordo acusa of among 1 december 2007 till 26 of july 2008 owing to participa in one organizacion cu had because; aim for comete crimennan. also the is wordo acusa of on 6 of july 2008 conhuntamente y in union cu one another or others y cu the intencion for take life of one or more person, owing to los one or more tiro cu one arm of candela in direccion of the car in cual the personanan here was sit. alavez the is wordo acusa of posesion of one pistool on the self date ey, without had permission. the caso here will wordo deal same cos cu esun upstairs menciona. after is follow one caso cu six sospechoso kendenan ta: d.g.d, h.j.j.c, a.c.d.w., n.w.w. y a.k.a.t. contra the are here also have one serie of acusacionnan cu have of haci of tiramento at various lugar y formacion of gang. d., c., a.w.,n.w. y t is wordo acusa cu in the period of 1 december 2007 till 26 of july 2008 they owing to participa in one organizacion cu had because; aim for comete crimennan. d., c. y a.w. is wordo acusa of owing to, cohnuntamente cu one another or others, throw cu one arm of candel in direccion of one y/of two person on 20 of july 2008, cu the intencion of less they life. they're wordo acusa alavez of posesion of pistool on 20 of july 2008, without had permission for this, y of posesion of one pistool y/of one revolver on 26 of july 2008, without permission. besides they're wordo acusa of posesion of patronchinan in the period of 25 till 26 of july 2008, without permission. n.w. is wordo acusa of, conhuntamente y in union cu one another or others y cu the intencion for take life of one or more person, owing to los one or more tiro cu one arm of candela in direccion of the car in cual the personanan here was sit on 6 of july 2008.
can some situation owing to leave for of hand fast of corte yesterday afternoon, corte of husticia in first instancia owing to cuminsa deal the caso of the so calling gang of dakota. one caso cu is pendiente for of enough time end. owing to cuminsa atende the caso in cual 2 ex militar is envolvi. the time yonder, they was form part of navy regal y because; such is being judge in one corte militar. 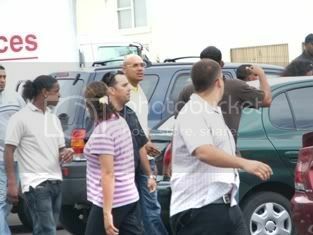 thing owing to happen after was, cu corte owing to dicidi of hear some witness, cu is miembronan of same gang of dakota. here father williams not owing to like thing the is hear, cu the testigonan here is come is tell of his yiunan, acusando they, siendo they know debidamente cu they're haciendo declaracionnan false. this owing to place angry of such as, cu the wanted owing to ask aclaracion is pakico they're change of opinion now. y as menciona, can some the situation owing to leave for of hand. 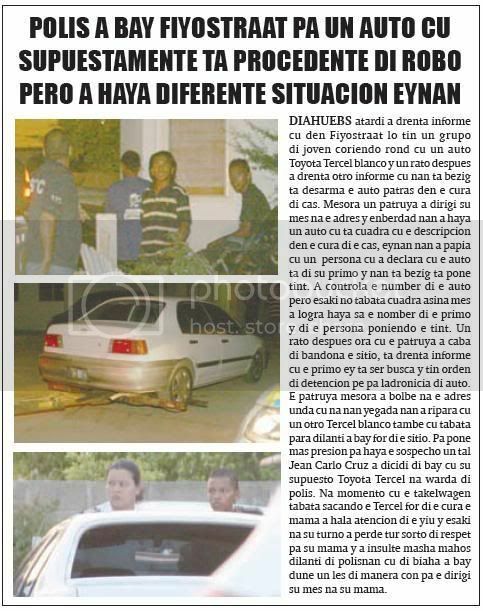 assure hour cu one of esnan cu was deteni, owing to cuminsa provoca y ofende family williams. y here family williams not owing to lose for earn y owing to place sla in curpa of esnan cu do not talk verdad. oficialnan of c.e.a., cu is responsible for seguridad of the.o. the presonan, owing to know of controla the situation much good, but hour the asunto owing to escala owing to ask refuerso of police. fiscal is proof cu 2 ex militar owing to form part of gang of dakota owing to demanda castigo pisa for they, 15 month for gumbs y 5 year for paredes berio for attempt of asesinato the tratamento of the caso of gang of dakota was much largo. the first part was one caso militar contra the two sospechoso, cu is luis paredes berio y kenneth gumbs, kendenan is form part of the remainder of the gang of dakota, but by cu the time of the susedidonan they was militar, they're wordo deal of the form here. 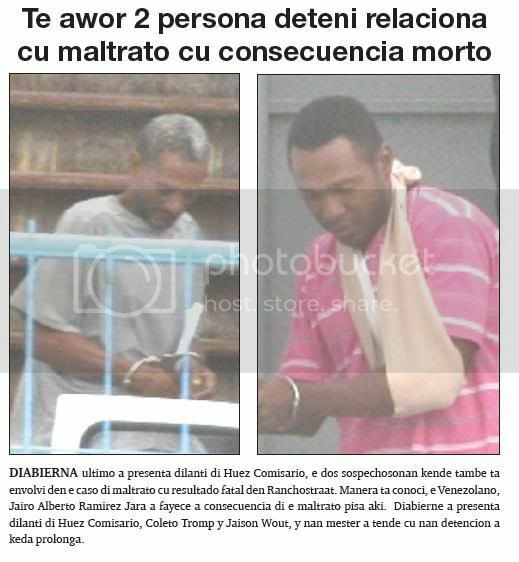 they're wordo acusa of 3 caso of attempt of asesinato, caminda tiramento did take lugar, esta day 6 of july 2008 at eagle beach, caminda owing to throw on car of he l.
also day 20 of july 2008 on territory of bouwmaatschappij caminda paredes berio is wordo acusa of owing to throw on person. t’asina cu have test of polvo of arm haci on hand of paredes berio y the result is show cu have indicacion cu paredes berio owing to throw in the period here. according paredes berio in savaneta kamp the was throw practicamente all day. past owing to tell cu day 1 july 2008 past owing to wordo suspendi y by the time ey not throw more. one another caso t’esun of day 26 july 2008 near of busto of boy ecury cu is stay near of juliana school, caminda had bashamento ball. here cabrera y paredes berio was present, while cu is derrick dania owing to throw on one car cu owing to happen y ocupantenan will owing to haci expresionnan cu not owing to cay at they agrado. fiscal owing to tell cu the is achieve kenneth gumbs culpable of violencia publico at eagle beach, caminda owing to throw stone on car together cu others. fiscal do not achieve kenneth gumbs culpable of posecion of arm y owing to declar’e pound for this. sinembargo fiscal is achieve kenneth gumbs y luis paredes berio culpable of is form part of one organizacion criminal caminda they was present at 3 incidente caminda had tiramento. esakinan is havana, bouwmaatschappij y eagle beach. fiscal is take esakinan at earnest y owing to exigi 15 month of jail for kenneth gumbs, while cu for luis paredes berio, past owing to exigi 5 year of jail. advocate mr. scheper that owing to defende kenneth gumbs do not achieve cu here is deal of one organizacion criminal y is achieve cu have to declara his cliente kenneth gumbs pound. the is achieve the 15 month of jail demasiado pisa. advocate mr. hernandez, also owing to tell cu the do not achieve cu his cliente, luis paredes berio is form part of one organizacion criminal. do not because the was present at all the incidentenan kiermen cu the is form part of the gang. the was simplemente leave cu his amigonan. 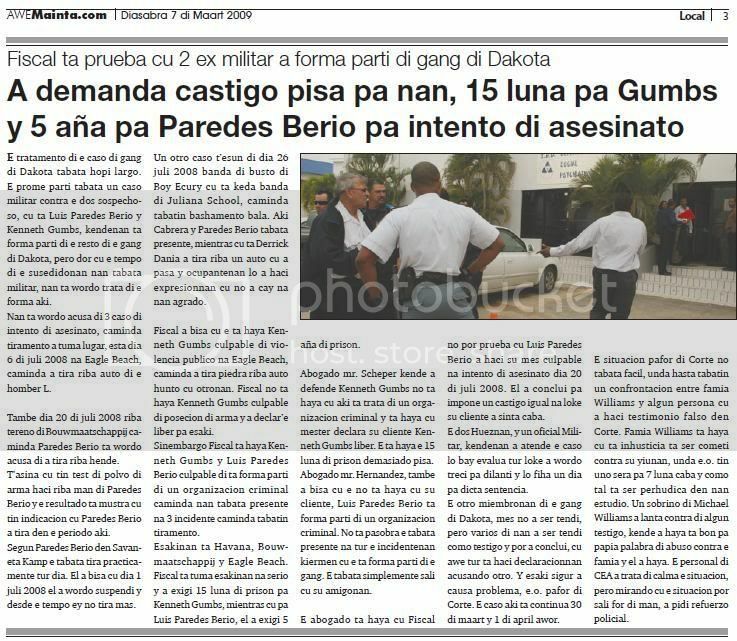 the advocate is achieve cu fiscal not can proof cu luis paredes berio owing to haci his self culpable at attempt of asesinato day 20 of july 2008. past owing to conclui for impone one castigo equal at thing his cliente owing to sit end. the two hueznan, y one oficial militar, kendenan owing to atende the caso will bay evalua all thing owing to wordo treci for fast y will fiha one day for dicta sentencia. the another miembronan of the gang of dakota, self not owing to being tendi, but several of they owing to being tendi because; witness y can owing to conclui, cu today all is haci declaracionnan acusando another. y this assure owing to cause problem, the.o. abroad of corte. the caso here is continua 30 of march y 1 of april now. 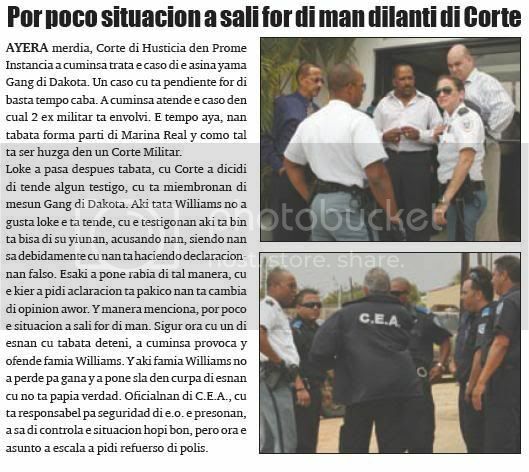 the situation abroad of corte not was facil, where even had one confrontacion among family williams y some person cu owing to haci testimonio false in corte. family williams is achieve cu is inhusticia is being cometi contra his yiunan, where the.o. have uno close for 7 month end y because; such is being perhudica in they study. one sobrino of michael williams owing to arise contra of some witness, that owing to achieve is good for talk word of abuse contra the family y past owing to achieve. the personal of cea owing to deal of calma the situation, but mirando cu the situation can leave for of hand, owing to ask refuerzo policial. One of the eight defendants in the Dakota case, the court inside. The case was yesterday morning until April 1 pending renewed testimony. ORANGE CITY - The trial against eight veelplegers, known as the gang of Dakota, was yesterday morning until April 1. The court wants two witnesses re-heard because of ambiguities in their statements. The hearing is scheduled for March 30. The group of men accused of a litany of crimes ranging from gun possession and use, membership of a criminal organization, the transport of drugs, drug possession and sale to manslaughter. The offenses occurred between December 1, 2007 and November 18, 2008. Two of the eight suspects are former military. During the examination of the charges against the two suspects, is a senior in addition to the military court. This military review the lawsuit and will end when a verdict of guilty of the accused, a punishment. 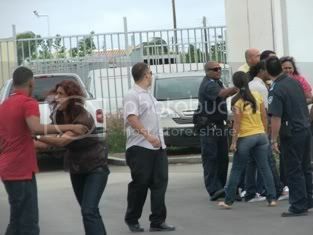 Shortly after the court suspended the case arose outside the courthouse a brawl. It is not clear between who was fought. It is said that a group of young people for the building one or more persons "was waiting. Although the police had turned the fight was already past when this spot was. diabierna morning Oficiálne of c.e.a. they owing to achieve is self extends and enhances the security of court buildings of rond. taking account of this at the sospechosonan dangerous cu owing to present they prison for longer, because at menasanan ricibi. till even the press have to stop owing to bay cu one some far more normal. oranjestad(aan): diabierna morning did take lugar two part of one caso relaciona cu the supuesto ‘gang of dakota’. the first part was one caso contra two ex militar acusa of is form part of one organizacion criminal, because; supuesto miembronan of gang of dakota. they owing to wordo acusa also of is envolvi in various caso of tiramento at july 2008.
after of the caso here, several witness owing to wordo listen relaciona cu the tiramentonan here cu did take lugar at havana, close of juliana school, at bouwmaatschappij y at eagle beach. mirando cu various sospechoso owing to declara contra another, apparently tensionnan owing to lever y after cu the casonan owing to termina, pafo various of the sospechoso y testigonan cu owing to present at corte, owing to cuminza quarrel cu another. first words insultante owing to cay, after of cual esnan in the problem owing to try agredi another. 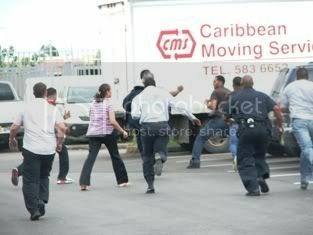 some amigo y family owing to try of stop the bululu, but cada trip they owing to cuminza bay on another again. have to tell cu is good cu was have enough agent of cea present y door of they actuacion, the action not owing to escala as assure was show of bay sosode. agentenan of cea at dado instant have to owing to employ klop if.casi they have to owing to employ they arm also, mirando cu some of the hendenan in the problem does not owing to respeta peticion of the agentenan of cea, for stop cu the action. at dado instant one of the personanan in the bululu till even owing to tell boss of cea for throw on dje cu his arm if the is man. thanks god boss of cea owing to stay calmo y together cu his agentenan owing to succeed stop the action. 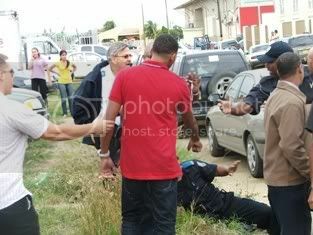 oranjestad(aan): luis the.p.b y kenneth j.s.g owing to present fast of huez, after cu they owing to wordo acusa of is form part of one organizacion criminal among december 2007 y july 2008.segun ministerio publico, is deal of miembronan of the gang of dakota. also they owing to wordo acusa of at various occasion los tiro in direccion of person cu intencion of less they life.banda of this they owing to wordo acusa of posesion of arm.como cu both is ex militar, the caso owing to wordo deal because; one caso militar. was have then two huez present, because; also one agent of mariniers kazerne. the caso here is part of one caso more big, in cual various sospechoso owing to wordo acusa of is envolvi in casonan of tiramento at eagle beach, tiramento at bouwmaatschappij, tiramento close of juliana school y tiramento at havana. 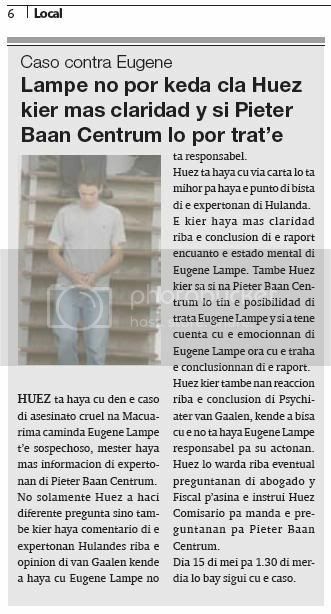 all the casonan here did take lugar at july 2008.huez owing to trece various part of the rapport of police fast.entre another past owing to splica cu on 6 of july 2008 testigonan owing to tell cu at dado instant hendenan owing to look at one person of surname hous. strike cu cuchio on one car cu was pasando eybanda. also they owing to look at various person is throw stone on the car, kibrando so glass of the car. testigonan owing to menciona name among another of acusado k.g because; one of esnan cu was at eagle beach y was part of the are of person cu owing to throw stone y at dado instant will owing to los some tiro. huez owing to ask about k.g if the was tey on the day ey y past owing to tell cu not.segun huez, various witness owing to tell cu they owing to look at k.g throw stone on the car. huez owing to tell cu among another the rumannan of surname w. kendenan also is sospechoso in the caso here, because; also sospechsoso luis b. owing to tell cu k.g was at eagle beach, but past owing to insisti cu the not was tey. for thing is acusado l.b, huez owing to make various question on the night cu was have tironan at havana y at bouwmaatschappij.l.b owing to splica cu after cu past owing to bay for of havana, past owing to bay near of bouwmaatschappij cu two child muher y at dado instant past owing to hear two tiro. past owing to splica cu past owing to look at various person eybanda, but the not know is that owing to throw cu arm.e is wordo acusa of is esun cu will owing to los tiro eybanda, but past owing to tell huez cu the not owing to throw. huez owing to trece fast also cu of the sospechosonan in the caso here esta hermaine j.j.c will owing to tell cu is l.b owing to throw.l.b owing to tell huez cu past owing to talk cu h.c y cu h.c owing to tell cu the will is dispuesto for tell cu do not l.b owing to throw. huez owing to tell also cu rapport of nfi of the netherlands owing to show cu hands of l.b was have rastronan indicando cu past owing to throw cu one arm. l.b owing to tell cu esey can have of haber cu the armanan cu the is employ at mariniers kazerne, but for some time first cu esey past owing to wordo less end for of kazerne. huez owing to make various question at l.b y k.g for achieve know if they owing to look at arm or was know of the armanan. both owing to tell cu they was have nothing of haber cu arm.nan owing to tell also cu they do not form part of one organizacion criminal.e mature cu they know sit together, not kiermen cu they're form part of one gang.k.g owing to splica cu the is play futbol cu much of the muchahombernan of dakota. huez owing to ask about l.b if hour cu they was sit together, the not owing to hear they talk of the problemanan of tiramento y of the gang of madiki etc. past owing to tell cu past owing to arrive of hear they talk of problem, but not cu they're bay throw or cu they owing to throw. l.b owing to tell huez cu if past owing to hear they talk of this, esey not kiermen cu the also owing to form part of the discusion etc. owing to achieve if two patronchi of arm at home of l.b, but past owing to splica cu the balanan ey is of riflenan of kazerne, cu past owing to coi because; souvenir, hour past owing to stop of is militar. fiscal owing to exigi one castigo of 15 month for k.g y for l.b past owing to exigi 5 year.abogado scheper representando k.g owing to tell cu his cliente do not form part of one organizacion criminal. for esey is the caso, have to have one structura, in cual everybody have one rol specifico. past owing to tell also cu majority of the declaracionnan contra his cliente is contradeci another. pesey past owing to ask for his cliente that not have carchi of castigo, wordo declara pound of all acusacion. advocate hernandez also owing to tell cu his cliente do not form part of one organizacion criminal y cu not have proof contra dje, cu past owing to throw. none person owing to tell cu they owing to look at the cu arm or cu they owing to look at the throw cu one arm. oranjestad(aan): diabierna derrick g.d, hermain j.j.c, ali k.a.t y the rumannan alfred c.d.w y nigel w.w owing to present fast of huez, debi at the mature cu they owing to wordo acusa of is form part of one organizacion criminal y cu they will is envolvi in various caso of tiramento cu did take lugar at july 2008.
diabierna owing to wordo planea for listen the 13 testigonan cu the abogadonan owing to ask pe.e first witness cu owing to wordo listen is one sospechoso in the caso here esta luis the.p.b.abogado edwin duijneveld representando the rumannan of surname w.a ask about the witness if the was at eagle beach on 6 of july y past owing to tell cu if. the advocate owing to puntre also if acusado derek d. was at eagle beach the day ey y past owing to tell cu not.duijneveld owing to ask about l.b also if is berdad cu his amigo gernee g. owing to tell cu dereck d. owing to pidie for her not owing to tell cu derek d. owing to los tiro at eagle beach y l.b owing to tell cu esey do not berdad. mirando cu g.g y l.b owing to come across on same night cu the tiramento cu did take lugar, duijneveld owing to ask about l.b if they owing to talk on thing owing to sosode at eagle beach y past owing to tell cu they owing to talk on cosnan normal. fiscal owing to ask about l.b if past owing to look at that owing to throw y past owing to tell cu not.huez owing to ask about l.b also if father of the rumannan w. esta michael w. owing to arrive of ofrece coin for her change his declaracion y declara at please of his yiunan. l.b owing to tell cu esey do not berdad.huez owing to splica cu past owing to ask about esey, because have person is saying esey.despues of listen l.b, m.j.h owing to present because; witness y advocate duijneveld owing to puntre if the was at eagle beach on 6 of july y past owing to tell cu not. duijneveld owing to ask about m.h also if past owing to bay together cu norwin d. that is brother of dereck d. close g.g, for pidie for her not owing to tell thing the know of the tiramento at eagle.m.h owing to tell cu esey do not berdad. the advocate owing to puntre also if is berdad cu father die rumannan w. owing to ofrece coin for declara at please of his yiunan y past owing to tell cu not. huez owing to confronte the hour ey cu the mature cu on 15 of feburary past owing to declara cu michael w. will owing to ofrece 10.000 guilder for her declara at beneficio of his yiunan. past owing to stop upstairs cu esey do not berdad.diferente of the testigonan not owing to present diabierna y they have to come corte another trip.testigo y.s.p if owing to present. the is pareha of g.g y advocate duijneveld owing to puntre if past owing to look at dereck d. at eagle beach on 6 of july, mirando cu g.g owing to tell cu past owing to look at d.d.e child muher owing to tell cu the not owing to look at d.d. duijneveld owing to ask about the child muher if past owing to look at m.h at eagle beach y past owing to tell cu if, siendo cu one rato first m.h owing to tell fast of huez cu the not was at eagle beach the day ey. the child muher owing to tell also cu past owing to hear the tironan, but the not owing to look at that owing to throw. huez owing to ask about the child muher is when g.g owing to bay close police because; witness y past owing to tell cu practicamente at once. huez owing to puntre what day g.g owing to tell cu the was know cu is dereck d. owing to throw at eagle y past owing to tell cu was till at january. another witness cu owing to present at corte is lianne g., that is pareha of dereck d. y brother muher of g.g. advocate duijneveld owing to tell lianne g. cu his brother g.g owing to tell police cu the lianne owing to puntre for her not tell cu dereck is esun cu owing to throw.e child muher owing to tell cu this do not berdad. for thing is the caso of tiramento at havana, advocate of dereck d. esta lotter homan owing to ask about l.g when dereck owing to bay close dje y past owing to tell cu d.d owing to arrive cas close dje among 1’or y 2’or of marduga. the advocate owing to puntre also kico owing to sosode fast of royal plaza among dereck y two person dutch. the child muher owing to count ; cu at dado instant dereck owing to saca one arm of candela for show the hulandesnan.el owing to tell cu past owing to angry very cu dereck. father of acusadonan w. esta michael w. also owing to wordo listen because; witness diabierna. past owing to wordo ask about if past owing to ofrece person coin for declara at please of his yiunan y past owing to deny rotundamente. miachael owing to declara if cu after cu m.h owing to wordo let in freedom, past owing to bay at home of family of michael y eynan past owing to tell cu dereck d. is esun cu owing to throw at eagle. after brother man, mother y brother muher of dereck owing to aparece also because; witness y they all owing to tell cu on the day cu was have tiramento at eagle beach, dereck was at home, at one barbecue of cumpleaños of his brother muhernan.nan owing to tell cu assure till at least 8’or of night the was tey cu they. ciclista is pour fist on taxista. till now 2 person deteni relaciona cu maltrato cu consecuencia dead diabierna ultimo owing to present fast of huez comisario, the two sospechosonan that also is envolvi in the caso of maltrato cu result fateful in ranchostraat. as is conoci, the venezolano, jairo alberto ramirez jara owing to fayece owing to consecuencia of the maltrato pisa here. diabierne owing to present fast of huez comisario, coleto tromp y jaison wout, y they have to owing to hear cu they detencion owing to stay prolonga. Page created in 10.283 seconds with 19 queries.